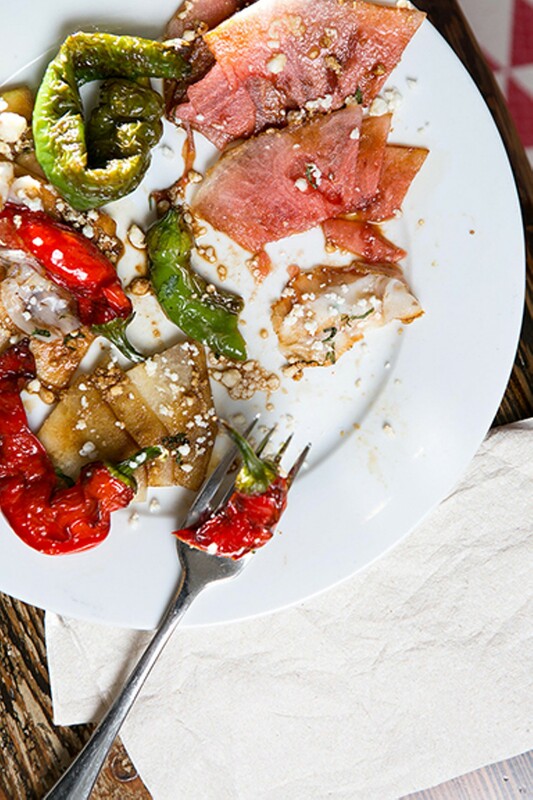 Chowhaus brings Oakland's food renaissance to Montclair. Chowhaus' Scotch egg might be the best in the East Bay. Hours: Tue.–Sat. 10 a.m.–10 p.m., Sun. 10 a.m.–4 p.m.
Life as an East Bay food enthusiast might bring you to an immaculately appointed, cathedral-like dining room in Uptown Oakland or to a pupusa counter in the back section of a Richmond liquor store, but very rarely does it necessitate a trip to sleepy Montclair Village — a lovely place to raise your kids, but until recently not anyone's idea of a dining destination. But just as tony Rockridge and Piedmont Avenue have gotten a recent infusion of vibrant, interesting restaurants, so it seems that the Oakland hills might soon have their moment in the culinary limelight. Chowhaus is a step in that direction, anyway. Open since May, it's already the closest thing Montclair has to a destination restaurant — or at least one that deserves a spot on any list of promising new eateries in Oakland. More than that, though, it aspires to be the quintessential neighborhood restaurant: Chef Tracey Belock (previously of the trendy downtown spots Tribune Tavern and Disco Volante) and her husband and front-of-house manager Joe Schnell live in Montclair themselves, and they felt the area needed a family-oriented place where customers of all ages could walk in — from morning to night — and grab something to eat. The name is a nod to the German gasthaus, a kind of tavern/inn/community hub found in small towns throughout Germany. With its bright primary colors and ever-so-slightly mismatched furniture, the space has the homey, high-ceilinged charm of a country farmhouse. And while the menu includes a few German-inspired dishes (a sausage sandwich and a couple of variations on schnitzel), Belock mostly serves the same kind of food she cooked at her past two downtown gigs: California cuisine, with the attendant promise of carefully sourced, seasonal ingredients, but also with a variety of reference points — British pubs, German biergartens, and the Cajun seafood restaurants and barbecue joints of the American South. Whatever the country of origin, Belock's cooking fits broadly into the comfort food category — updated versions of hearty and familiar dishes that combine a whiff of nostalgia with Bay Area cuisine's preference for clean, simple flavors. So Belock, who worked in Germany for several years, makes a fairly traditional pork schnitzel — coated in breadcrumbs and expertly fried — that ought to please any erstwhile German schoolboy or schoolgirl. But hers was the only version I'd ever eaten that featured a brined, bone-in rib chop instead of the usual cutlet pounded pancake-thin — a substitution that made for a juicier and more luxurious eating experience. Served with mashed potatoes; grilled broccolini; and a rich, comforting mustard-cream sauce, this was Belock's crowd-pleasing take on the meat-and-potatoes dishes of the American heartland — with a Cal-German spin. 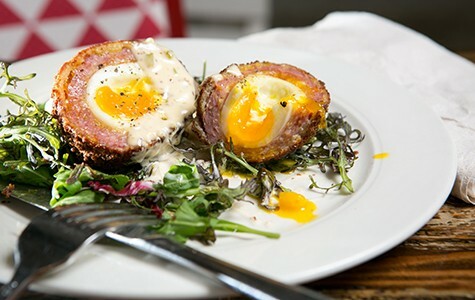 For her Scotch egg, that British working-class staple of sausage-wrapped egg, Belock soft-boils the egg before wrapping it in deeply savory housemade fennel sausage and dropping it the deep fryer. The result, with its bright-orange, creamy yolk, might be the best of the handful of versions of this dish that have cropped up in the East Bay. And a summer-y, refreshing melon salad was draped with thin shavings of wonderfully smoky Tasso ham — a nod to Louisiana, and part of the kitchen's ever-expanding repertoire of housemade charcuterie. But my favorite dish of all may have been Belock's take on chicken pot pie, which looks utterly conventional until you break into the pie's flaky top crust and taste the sweetness of the shelled-fresh-from-the-pod English peas, and dig into the thick, soupy filling, which has the distinct, unmistakable flavor of cream of mushroom soup — but tastier than the stuff from a can by many orders of magnitude. Like much of the menu at Chowhaus, the dish seems designed to evoke childhood memories; after all, Belock drew inspiration from the pot pies her mother used to make by mixing together a couple different cans of Campbell's. All of which is to say that Chowhaus isn't just the best restaurant I've been to in Montclair, it's also the specific kind of good restaurant that seems perfectly suited for an area that isn't known for gastronomical risk-taking. It's hard to say how, say, an un-Americanized Burmese restaurant or a high-concept "molecular" restaurant would fare in the village. But Chowhaus straddles the line perfectly, serving "normal" familiar food prepared with enough care, and enough of a twist, to keep the interest of someone who's more adventurous. It's fitting, then — if the steady stream of young families who frequent the restaurant is any indication — that Chowhaus' most popular item of all might be the chicken "Nugs," which are precisely what they sound like. Belock makes these by mincing thigh and breast meat taken from whole Mary's Organic chickens, and then brining, breading, and, finally, deep-frying each well-seasoned nugget. I'm not ashamed to say it: The Nugs, available as an add-on to any of the salads, were as popular among the adults in our party as they were with the lone child who accompanied us. What's also nice about Chowhaus is that it's a rare sit-down restaurant that serves breakfast throughout the week (similar to a gasthaus, which will typically serve food from morning to night). In fact, the daily brunch menu is available all day long, right up until dinner service starts at 5 p.m. (The brunchier items are more plentiful on weekends, but there are always at least a couple of egg dishes.) While the chilaquiles we ordered one Sunday morning featured a tomatillo salsa that was too overpoweringly sour, I appreciated that the optional pulled pork that came on the side — a thick slice of slow-cooked shoulder — was smoky enough, and tender enough, that it practically qualified as barbecue. Meanwhile, the two other brunch entrées I tried — brioche French toast and something Belock has dubbed a "knuckle sandwich" (pastrami made from the beef "knuckle"/shoulder piled onto a brioche bun) — were pretty much impeccable. Even though most of the food at Chowhaus plays off of European traditions, with a dash of Americana mixed in, Belock isn't inclined to put herself into any particular box. Her use of Mexican flavors extended beyond the chilaquiles to a weekly Taco Tuesdays menu. One of her early mentors was Neath Pal, a Cambodian fine-dining chef who gave her the recipe for the "magic spice" mix — a salty-tangy mixture of paprika, cayenne, and other spices that's as addictive as MSG — which she uses to season potato chips and a bar snack of toasted nuts and sunflower seeds. Belock said that at some point in the near future, she might even put a couple of Pal's Asian-fusion dishes on the menu — a lobster curry or a dessert of chocolate-filled fried wontons. These aren't the kinds of things that you'd expect to find at a comfort-food restaurant with a German-sounding name. But what is California cuisine if not a fusing together of all of these disparate food traditions? If you want to see what it's all about, you might just have to schedule a trip to Montclair.